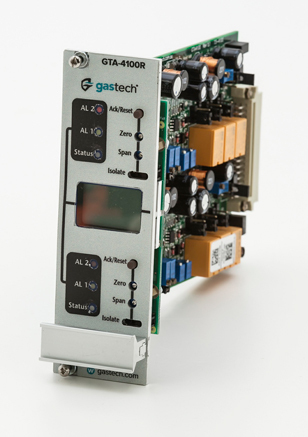 Our customer requirements were a simple dual channel controller card with a high level of reliability. One processor per channel, so if a processor fails only one channel will be affected. Minimal shared components increase reliability. Minimal training for commissioning and calibration maintenance. Minimal add-on options to complicate things. A simple reliable system with all the features we need. A simple reliable system with all the features we need. What our engineers have developed is a dual channel dual processor card. This card has two separate circuits with only a High-resolution display being shared. The display is a non-critical component, which does not influence the operation of the system. Basically if the display fails both channels will still operate correctly. The High Resolution Graphical LCD component has been selected due to it's unique dual write feature. This allows both processors to write to the display at the same time. Top half for the top channel and the bottom half for the bottom channel. If one channel has the processor fail the display will continue to operate just displaying the other channel. Card layout has been set up so the user can easily identify each channels circuity and adjustments. We have used a number of switches, which allows the user to set up the card to suit a number of different applications and field devices. A basic graphical display on the PCB shows the different settings allowing minimal documentation for set-up. 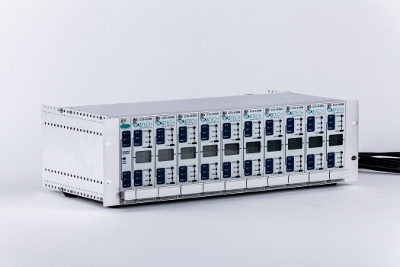 A common module has been designed to handle the synchronisation of all the cards. Basically this is cosmetic so all the alarm LEDs flash at the same time. This also holds the panel buzzer and the common relays. This has a feature to zone the top channels together and the bottom channels together giving you common alarms to the top channels and common alarms for the bottom channel. Inputs Two 1.4 to 24 VDC 4 to 20 mA analogue signal inputs, source or sink type, two or three-wire. 3 wire catalytic, 0-1V, 0-5V, 0-10V, 0-24V. 24V Digital, and resistance.